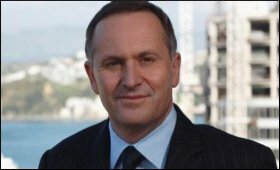 New Zealand Prime Minister John Key on Saturday left for his first visit to India to meet his counterpart Dr Manmohan Singh and discuss the free trade agreement between the two countries. Key is accompanied by a 26-member delegation that includes Minister of Trade Tim Groser and Indian-origin MP Kanwaljit Singh Bakshi. The prime minister will meet Manmohan Singh and other ministers in New Delhi. The delegation will also visit Agra and Mumbai and will be back in New Zealand July 1. Key will also promote his government's India strategy, which aims to position India as a core political, economic and trade partner for New Zealand by 2015. He said the strategy has been developed by government agencies in consultation with business houses, exporters and academics. "The key to this strategy is to successfully negotiate an FTA (free trade agreement) with India. This is one of our top trade negotiating priorities. This will help expand businesses, create jobs and result in a stronger New Zealand economy," Key said. "The trade potential of the India market is huge and we have set a target of growing two-way trade from 1.28 billion New Zealand dollars to three billion by 2014," he added. Wenceslaus Anthony, chairman of the India New Zealand Business Council, who is a member of the delegation accompanying Key, said it was a matter of pride to be part of this historic visit. "This trip will strengthen the trade relationship between India and New Zealand. Trade Minister Tim Groser had a very successful talk regarding the economic relationship between India and New Zealand with Indian Minister of Commerce and Industry Anand Sharma during his New Zealand visit last month," Anthony said. Richard Howard, honorary member and former chairman of the New Zealand Association for Migration and Investment, said the visit will be a milestone in strengthening bilateral relations and will open many opportunities between both the countries.